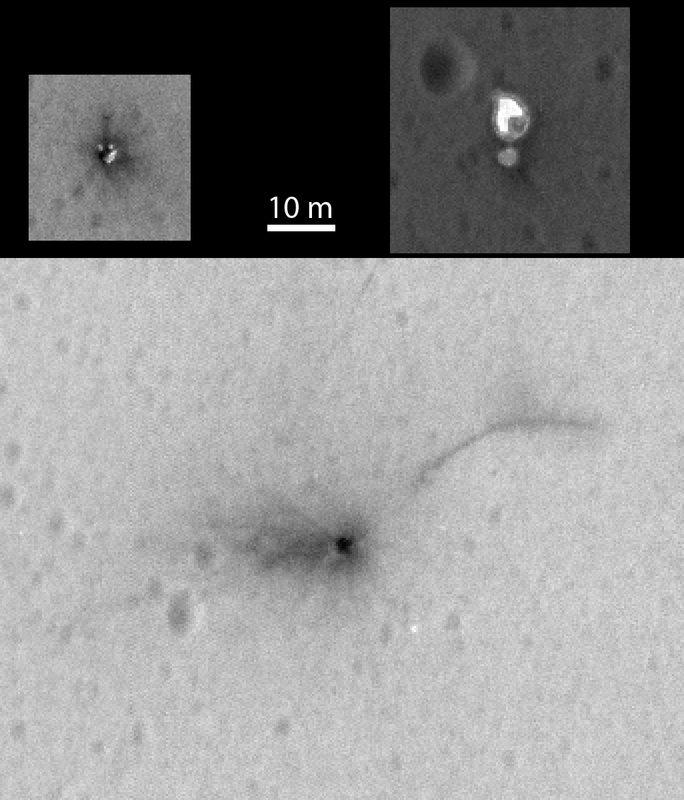 The ExoMars Schiaparelli Lander or Entry, Descent, and landing Module (EDM) reached the Martian surface on 19 October 2016, along with the Trace Gas Orbiter. 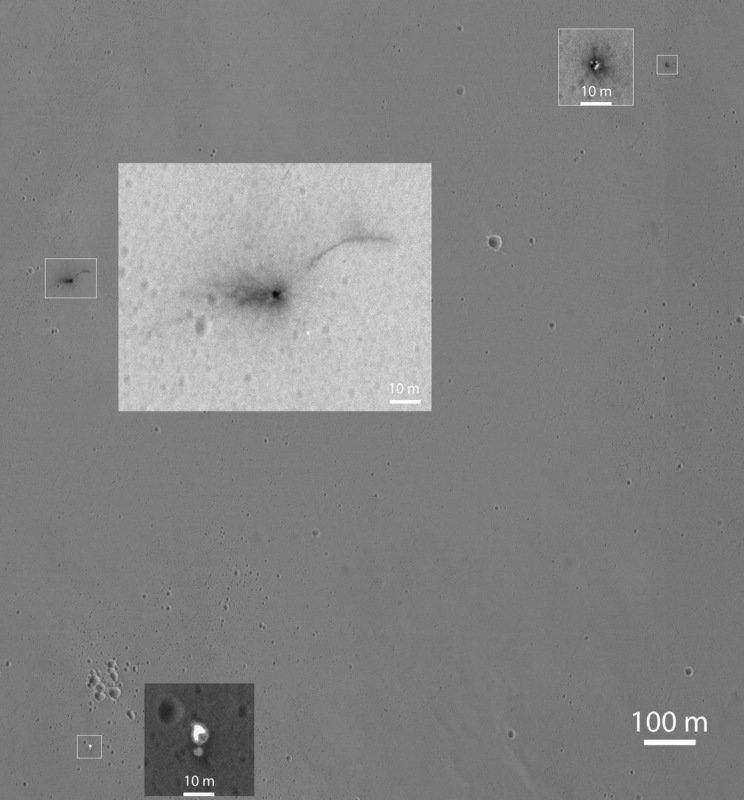 According to the ExoMars project, both the heat-shield and backshell-plus-parachute separated as planned, but the lander crashed at more than 83 meters per second (more than 300 kilometers per hour) velocity. This is the first HiRISE image of this location, captured in the black and white but not the color image area. The image reveals 3 anomalous features within about 1.5 kilometers of each other, as expected. The annotated image shows the HiRISE subscene covering all 3 features, with 6x enlargements of each feature with a local min-max stretches to each enlargement to best show the details. These images are in raw image geometry rather than map-projected, and north is about 7 degrees west of straight up. At lower left is the backshell and parachute. The parachute is many times brighter than the Martian surface in this region. The smaller circular feature just south of the bright parachute is about the same size and shape as the backshell (2.4 meter-diameter). At upper right are several bright features surrounded by dark radial impact patterns, located about where the heat shield was expected to impact. The bright spots may be part of the heat shield, such as insulation material, or specular reflections. At mid-upper left are the markings left by the Schiaparelli module. The dark circular feature is about 2.4 meters in diameter, about the size of the shallow crater expected from this mass (approximately 300 kilograms) impacting at about 100 meters per second into dry soil. The crater should be only approximately 0.5 meters deep. From this image we cannot clearly see the topography indicating the presence of a crater, which may be confirmed in later HiRISE images. Surrounding the dark spot are dark radial patterns expected from an impact event. The dark curving line to the northeast of the crater is unusual for a typical impact event, and we do not attempt to explain it here. Surrounding the dark spot are several relatively bright pixels or clusters of pixels. This could be image noise, or they could be real features, perhaps fragments of the lander. A later image will confirm if these spots are image noise or actual surface features. This is a stereo pair with ESP_048120_1780.